To the Curb: Elton John's 'Greatest Hits' didn't make the cut in the author's packing materials. RELOCATION is a drag—quite literally; you wind up having to drag junk out that you hid away because you didn't feel like dealing with it at the time. This is cleansing, in a way; we're getting rid of maybe half of our possessions, but it's a half we're not particularly attached to, like furniture we found for free on the curb. What we are not getting rid of is music. 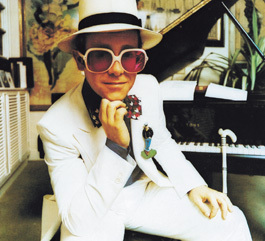 I'm keeping everything except Elton John's Greatest Hits, because I now hate his songs. I can thank the day-care center next door, which frequently blasts awful soundtracks to 21st-century Disney movies. So Sir Elton stays behind, but we are rounding up and herding the rest of the gang across the country. I will pack the music last, because I will need it up to the very last California moment. We plan to drive across the country and stay in a cramped sublet in Queens, N.Y., which we will share with three other roommates for two months. By the end of those two months, we hope to have found a place of our own, at which point we will be reunited with the stuff we kept in storage, music included. This means that, if I have an incurable urge, like the one I woke up with last week, to listen to Chapterhouse's Whirlpool, I not only won't have access to Whirlpool, I'll have the song "Pearl" stuck in my head for two months. That is not acceptable. The majority of Mr. Bir Toujour's music library is contained on his iPod. When we embark on our weeklong road trip, he will have any song he fancies right at his fingertips, a vast selection of bands whose names and music sound way too similar. What's the difference between Ariel and Arial Love Feed? How about eE and the Letter E? "They're both primarily instrumental," notes Mr. Bir Toujour. His musical sensibility leans heavily toward the soporific, which, in my estimation, is terrible for a road trip—you want to stay alert and peppy, maybe sing along a bit. More than my clothes, more than my kitchen accessories, more than my books, I feel my music defines me, and that if it is removed from me, I will cease to be the person I am. That's a very modern belief, and it's kind of stupid. The music a person listens to naturally reflects lifestyles and ideals, but—despite what virtually every television show and shiny magazine would lead us to believe—the music we own is not an end in itself. Music or no music, as Ashlee Simpson says, "I Am Me." I can roll with that—for two months, at least.